Maximize your robot vacuum’s cleaning power with these maintenance and cleaning tips and tricks. While the iRobot Roomba may be one of the most recognizable robot vac, all robotic vacuums in general including EcoVacs, Shark ION, Ilife, Samsung PowerBot, Neato BotVac, and PureClean, are a phenomenal way to keep the house clean with almost zero user effort. To keep your vacuum appliance running like new, Robot Vacuum Cleaners require some maintenance to maximize their effective life. Neglecting to care for your little mechanical housekeeper can often mean a costly battery replacement much sooner than necessary, or worse, device failure after the warranty period. 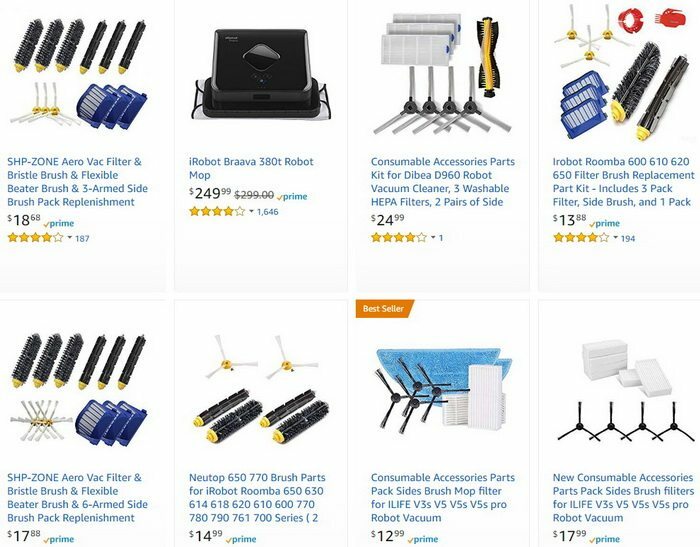 Below, we’ll cover some easy ways to ensure your Roomba or robot vacuum housekeeper of choice will be sweeping merrily along years from now. iRobot states that the Roomba battery can run for up to 2 hours and last about 400 charges. However, failing to exercise some battery-conscious user habits can drastically shorten the expected life. The most important way to maximize battery life is to keep Roomba charged as much as possible. Repeated discharge and recharge are the best ways to keep your Roomba’s nickel-based battery in tip-top shape. Avoid leaving the battery unused or stored for long periods at partial charge, and try to make sure Roomba has access to the charging base whenever It’s not at work. An occasional full discharge it useful as well by simply running Roomba until the power runs out. Recharge Roomba as soon as you can after each cleaning cycle as leaving the battery uncharged for extended periods can damage it. Extreme heat and cold are both harmful to a Robot Vacuum’s electronics and battery. When placing the charging base, make sure to avoid any areas that receive intense sunlight or excess heat from a vent or appliance. While Robot Vacuum’s can be used to clean cold spaces like garages and other areas, avoid storing your device there, while a cool dry place is best. Freezing temperatures or excessive humidity can severely impact your robot unit’s lifespan. Robot Vacuum’s have powerful brushes for picking up dirt, dust, and hair. However, failing to consistently inspect the brushes for impacted hair or litter means the robot vac will be drawing far more power than necessary to keep everything running. Particularly if you have pets, a weekly brush removal and cleaning will ensure energy-efficient operation and maximize your robot vacuum’s cleaning ability. Additionally, remember that Roomba is a vacuum, not a mop, avoid letting Roomba perform cleaning cycles in areas with spills, sticky debris, or similar conditions. In particular, non-OEM batteries and charging stands should be avoided. Many of these products, while cheaper than a factory original, are designed to sell, not to promote the wellness of your device. In the event you require a replacement charger or battery, it is well worth it to pay a little more for an authentic device properly designed for your Roomba. Extended periods of disuse are not ideal for promoting a long lifespan for your robot vacuum. At the very least, a weekly cleaning cycle should be engaged to make sure Roomba’s battery is getting exercised, so to speak. If you are planning on purchasing a device for only occasional cleaning, consider an alternative product. If you will be away or otherwise unable to run Roomba regularly for an extended period, fully charge the battery and either disassemble, or, if your model supports it, place it in “Vacation Mode.” Do not leave Roomba or other robot vacuum’s docked and charging for extended periods without activity. Always remember to empty the debris tray. If you do not empty the debris tray after every use, the items that the robot vacuum has sucked up may compact and will make it harder for your robot vacuum to pull in more debris. So just remember, it is best to always empty the debris filter tray after every use. And there you have it, the 5 golden tips to maximizing the lifespan and performance of your robotic vacuum cleaning assistant! By exercising just a few simple habits, you can ensure your robot vacuum enjoys many years of cleaning adventures. If you’d like to learn more about the best practices for maintaining and caring for devices like Roomba, EcoVacs, Shark ION, Ilife, Samsung PowerBot, Neato BotVac, and PureClean robot vacuums, simply leave a comment below and we will answer any of your technical questions. Next post: How Do You Delete Your Hulu Account?